I eat the same thing for breakfast every day: cream of buckwheat, grass fed butter, a ferment, and usually a fried egg or bacon. First of all, this is delicious and has changed my life for the better. Second of all, and more relevant, I started to notice that when I combined eggs and ruby sauerkraut, the egg whites would turn blue. I noticed, and wondered, but didn’t know what could cause this. Then, as a part of a chemistry block at Sunbridge (Waldorf teacher school), we came into the classroom one day to find dozens of plates filled with a thin layer of cabbage juice. We played with adding drops of lemon juice, baking soda, vinegar, and later even lye and hydrochloric acid, each adding a new color to the rainbow swirl that had become of our purple juice. The next day we shared our observations and “discovered” that alkaline things turned it to blue or green or acrid yellow, acidic things to pink, red, or orange. We had created PH scales! I thought about my eggs anew after that experience, noticing how the acidic fermentation environment turned the purple cabbage pink, and that it turning to blue on my eggs must mean that the egg whites were slightly alkaline. 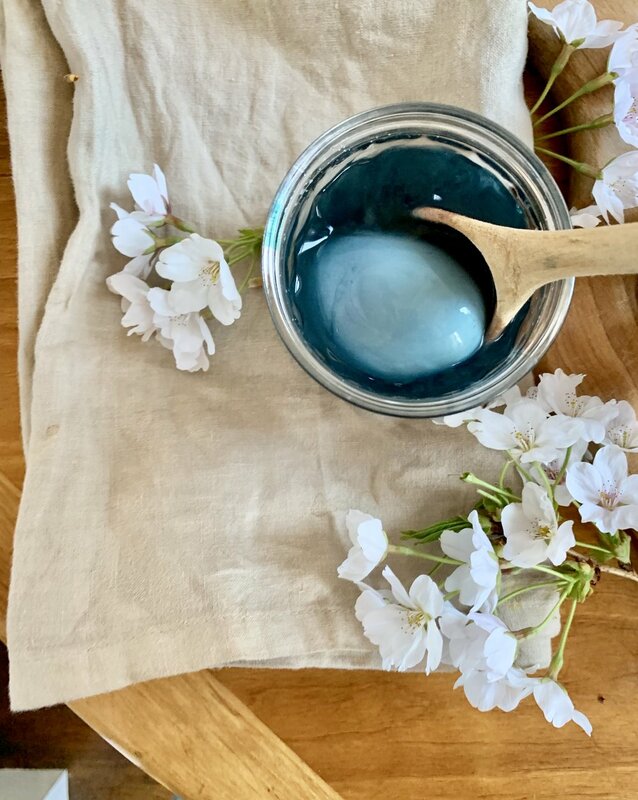 I thought about this as I considered my annual attempt at egg dying: always somewhat disappointing with the brown eggs I buy and the natural dyes I insist on. I also thought about the beautifully vibrant beet pickled eggs I’ve seen, and wondered if that process could be recreated with other vegetables, maybe minus all the sugar the picking recipes seem to call for. After all, the whites of eggs are always white, no matter the shell, and from my breakfast experiments I knew they take dye readily. A little kitchen playing later and I figured out how to use purple cabbage to make blue and pink and purple eggs, and turmeric for gold (because you’d have to add something very alkaline to cabbage to turn it that color and I don’t think any of us want to play around with lye near our food). Read on if you’d like to try yourself! First of all, peeling eggs is great fine motor practice for kindergarten-ish aged children. Try with younger ones too if they’re especially dexterous and/or you’re okay with a less than perfect final product. Same goes of chopping, pouring, and grating! Second of all, though we’re playing with chemistry here, that is where it should remain: as play. You’re planting seeds of experience that can grow with the children, transforming into theories when your child’s mind is ready and eager to understand things that way. A young child will marvel at the colors shifting, wonder at this miracle in the kitchen, and have a full, beautiful experience unhindered by unnecessary explanations. If you have an older child (10+) at home, let them experiment and wonder too—they’ll likely find a conclusion, though not necessarily the one I did, and not necessarily right away. That’s fine. Let this live in them. Boil a pot of water. add eggs, simmer for 8 minutes. Dunk eggs in an ice bath immediately after taking them out of the water to prevent overcooking and make them easier to peel. (Also, older eggs are easier to peel, use the ones from the back of the fridge if possible.) Once cooled, peel your eggs. Chop up about 1.5 cups of purple cabbage. As perfection and evenness are far from the goal here, this is a great opportunity to enlist a little chopping helper! Add to about 3 cups of water, simmer for about 10 minutes. When done, strain out the cabbage chunks and pour into a jar. 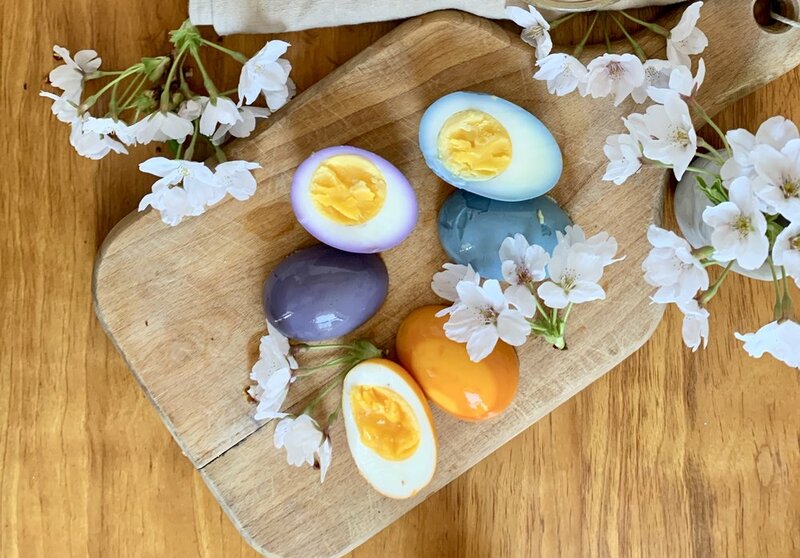 For pink/purple eggs, add some apple cider vinegar. The more you add, the pinker they’ll be! I added about two capfuls for these nicely purple ones. For blue, the eggs themselves will do all the PH shifting for you! Add your peeled eggs to your jar, then put it in the fridge for about a day, longer for a stronger color. That’s it! Finely grate about 2” of turmeric root. Add to about 3 cups of water, simmer for about 10 minutes or until the water looks nice and thickly golden. You could try using powdered turmeric too, just play with the amount until the color is strong in the water. No need to strain, just pour into a jar. Add your peeled eggs to your jar, then put it in the fridge for about a day. Peeled eggs keep in the fridge for a few days to a week, though it the recommendation is to keep them in a jar of water, changing the water daily. I ate my eggs too quickly to find out, but assume leaving them to soak in fresh water would cause some dye to leech out so, beware. My “hard boiling” suggestions are really for eggs just short of hard boiled, with a slightly soft yolk how I like them. If you’re worried about feeding slightly raw egg yolk to children (which you can do your own research on), simmer them for 9-10 minutes. If your eggs are smooshed up against the side of the jar or poking out of the liquid a bit, you might get some lighter spots. You can decide if that counts as a mistake or a design feature! A MILLION thank yous to George McWilliam, my teacher at Sunbridge and a deeply amazing person, for bringing the cabbage chemistry experiment and not answering my question about why my breakfast was turning blue right away, leaving me to stew and ponder and figure it out myself.